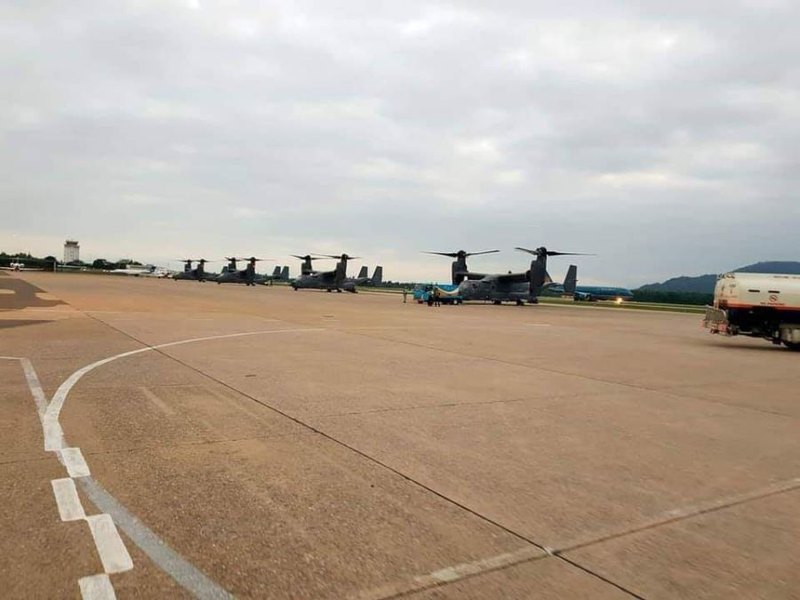 YOKOTA AIR BASE, Japan — Air Force CV-22 Osprey tiltrotor aircraft landed in Vietnam for the first time ever last week on their way to military drills in Thailand, a spokeswoman for the 353rd Special Operations Group confirmed Friday. The visit was flagged by a photograph of four of the helicopter-plane hybrids at Danang International Airport posted on social media Thursday. The Ospreys in the photograph are stationed at Yokota Air Base, Japan, but belong to the Okinawa-based 353rd, spokeswoman 1st Lt. Renee Douglas said in an email. Relations between the United States and Vietnam have warmed considerably since the nations fought a bloody war that ended with the withdrawal of American troops in 1973 and victory by communist forces over South Vietnam in 1975. The U.S. normalized relations with Vietnam in 1995 and lifted an arms embargo in 2016. Last March, the USS Carl Vinson made a port call there, the first in that country by a U.S. carrier since the Vietnam War ended four decades ago. Danang, which was a major U.S. military base during the war, is now Vietnam’s third largest city. President Donald Trump announced during his State of the Union address Tuesday that he will meet with North Korean leader Kim Jong Un in Hanoi, Vietnam, Feb. 27-28. Danang is a regular fuel stop for U.S. military aircraft transiting the region, but this was the first time the CV-22s had been to Vietnam, Douglas said. Cobra Gold, which involves nearly 4,000 U.S. troops training ashore and afloat in Thailand, began Jan. 20 and runs until Feb. 23, she said. This article is written by Seth Robson from Stars and Stripes and was legally licensed via the Tribune Content Agency through the NewsCred publisher network. Please direct all licensing questions to legal@newscred.com. next We were covering the Iranian revolution. A single gunshot still haunts me.